You’re going to hear it hear first. If you play Fantasy baseball (especially if you are in a head to head league) draft Clete Thomas. No, don’t draft him early, but draft him and at least keep him stashed. He showed a lot of his potential last year and should (hopefully) get his first full year in the pros coming up. Personally, I’m going to draft him with the 3rd to last pick. "I figured out a few things (since his last time up with the Tigers)," the wide-eyed Thomas said with a blank expression. "Figured out how to keep me consistent up here and that I've got to stick to my key points, and that way I'll succeed." If the Tigers do the right thing and dump Miggy Cabrera then Thomas should see ample playing time in 2010. He’s not paid all that much. He’s got that blue-collar image going, people like that. He has country music playing when he comes up to bat. That’s all I can piece together. Some of those points are the same points the Brandon Inge people have been making for years (just replace country music with lousy alternative rock). To me the bottom line is this. Clete represents something unwritten about Baseball; fans make the superstars, not the stats. If he’s popular then he’s a star, it’s as simple as that. Also, there are worse players to be compared to than Brandon Inge. 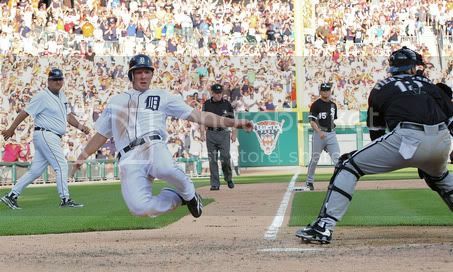 …of Clete Thomas' seven homers, five got the Tigers even or got them the lead. "Clete Thomas always has a crazy look on his face. His eyes are just huge. He looks like at any minute he could snap and kill a guy..... or hit a baseball 422 feet"
Going in to 2010 he will competing with Ryan Raburn and Casper Wells for that third OF spot. The Pirates have indefinitely suspended pitcher Mike Felix, their second-round draft pick in 2006, after he was charged with a DUI early Friday morning and benched by short-season State College over the weekend. The Daily Collegian reported yesterday that Felix had a .19 percent blood alcohol level. Felix, a 24-year-old left-hander, has struggled immensely with control as a professional, though his 3.33 ERA in 10 appearances this season has been an upgrade. Seems the Yokohama Bay Stars are now looking into Chris Bootcheck to be their closer for the 2010 season (and yet another indication that the team is ready to move forward with Shun Yamgauchi in the rotation next year). Bootcheck is a 30-year-old righty in the Pirates organization. He has tossed a total 147.1 innings in the Majors over his career and has a 6.54 ERA (1.64 WHIP) to go along with a 3-7 record with 1 save. A Bay Stars rep said, "In another step forward in rebuilding our team, filling our closer position with a foreign player is a big goal of ours." Major League veteran Levale Speigner struck out three over 3 2/3 innings of scoreless relief for the win as the Lobos sent the Leones to their fifth loss in six games. Perhaps the most encouraging part of Hulett’s minor league record is his ability to work counts and take walks. With about a 4:5 minor league walk to strikeout ratio, Hulett brings a great approach to the plate, though he has had trouble translating those skills to the majors, striking out 23 times in 67 at-bats. Still, with the limited sample size involved, the verdict is out as to Hulett’s ability at the major league level. Plugged into a utility role in the major leagues, Tugs could develop into a pleasant surprise for the big club. Entering his age-27 season, he still has the chance to turn his AAA successes into major league ones, so there’s reason to be optimistic about the Sox acquisition. "Three or four weeks before [my junior] season started last year, I started pitching better," said Hubbard. "At the team meeting before the season [the coaches] told me I was going to be closing games. That's what I like to be doing. I was more of the closer last year and that was a lot more fun than starting." Through his trials and tribulations on the field, Hubbard, who throws a two-seam fastball, a cutter and is working on his changeup, has learned valuable lessons that will help him once he graduates and enters the career world. "Baseball is a game of failure. It makes you mentally stronger," said Hubbard. "It also helps you work through adversity better than others. If you want something, you can do it. I was struggling my first two years here and now I've figured it out. I didn't transfer. I didn't quit on myself."